Major roundabouts are busy dangerous places for cyclists. 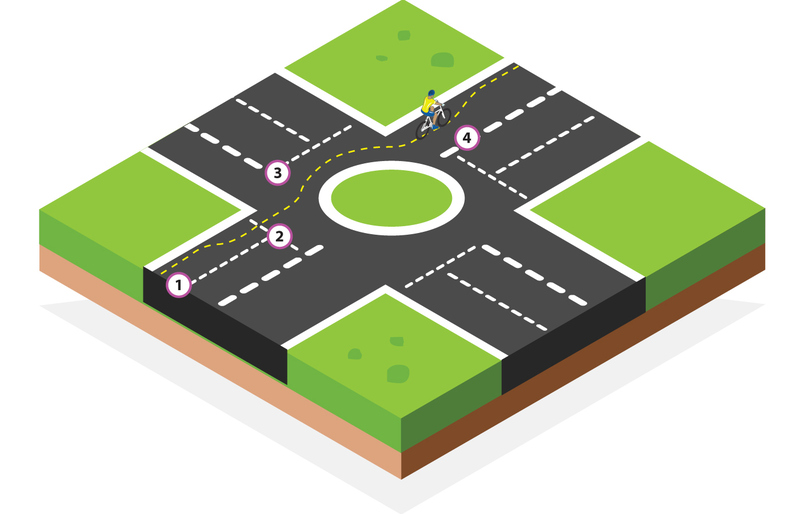 Level two cyclists are taught how to turn left on a major roundabout, however going straight ahead or turning right are level three skills. If you are approaching a major roundabout and you have any doubt whether you can cope, or you are a young inexperienced rider, come to a stop, get off your bike and walk around as a pedestrian. As with all cycling, being seen is the key thing to make sure of; this is vital on a roundabout. Drivers have lots to think about and lots to look out for. Make sure you can be seen. In Jersey and the United Kingdom, you must give way to traffic on your right. If you are riding on the continent or in a country where they drive on the right, you must give way to your left. For a left hand turn, use the left lane as you approach. Make sure that your fingers are covering your brake levers in case you need to stop quickly. Well before you get to the junction, check back and if safe move to the primary riding position for your lane, block the lane so traffic cannot overtake you. If necessary, give a clear left hand signal, long enough for everyone to see and replace your hands back on the handle bars, your fingers covering both brake levers. Before you get to the give way line, look to your right and assess if it is safe to ride onto the roundabout. If it is safe, ride onto the roundabout into the primary riding position so as to be seen and dominate your road space. If there is traffic coming, stop behind the give way line, set your pedal and wait until it is safe to go. Ride onto the roundabout. Keep to the left lane, but ride in the primary riding position. Riding here will help you to be seen. Signal left as you approach your exit, turn into your exit. Stay in the primary riding position until you think it is safe, look back over both shoulders and return to the secondary riding position when safe to do so. When you are intending to ride straight on use the left hand lane. Well before the junction, check back and move to the primary riding position in the left lane, block the lane so traffic cannot overtake you. As you approach the junction, begin to decide if it is safe to ride onto the roundabout, if it is safe, ride onto the roundabout and take up the primary riding position in the left lane. If it isn’t safe, wait behind the give way line. Set your pedal and wait until it is safe. As you approach a lane of traffic waiting to drive onto the roundabout, try and get eye contact with them, if you think it necessary, give a clear right hand signal so that they know you are continuing around. Signal left as you approach your exit, turn into your exit. Stay in the primary riding position until you think it is safe enough, check back over both shoulders and if safe return to the secondary riding position. For a right hand turn, use the right lane as you approach. Make sure that your fingers are covering your brake levers in case you need to stop quickly. Well before the junction, check back and move to the primary riding position in the right lane, if necessary, give a clear right hand signal right and block the lane so traffic cannot overtake you. As you approach the junction, look to your right (in Jersey and the UK) decide if it is safe to ride onto the roundabout, if it is safe, ride onto the roundabout and take up the primary riding position in the right lane. If it isn’t safe, wait behind the give way line. Set your pedal and wait until it is safe. As you cycle around the roundabout in the right lane, stay in the primary riding position. As you are approaching your exit, check back over your left shoulder, give a clear left hand signal and if safe exit the roundabout. Stay in the primary riding position until you think it is safe and then look back over both shoulders and return to the secondary riding position when safe to do so. 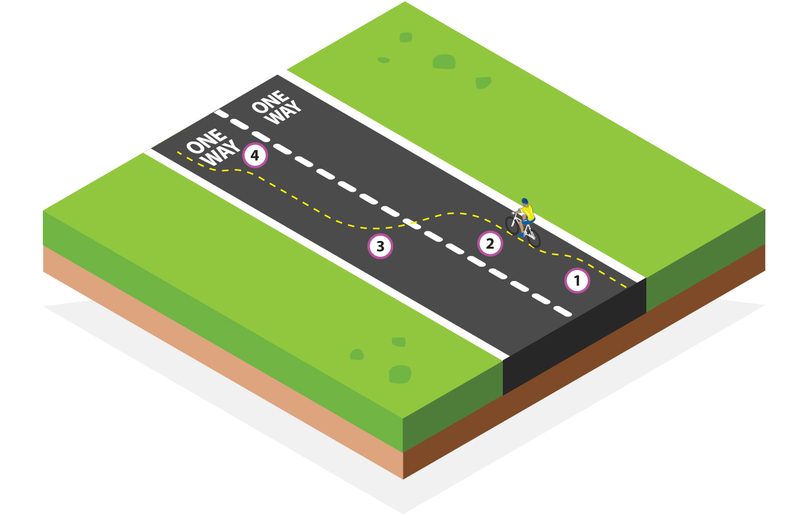 In this example the cyclist is in a one way road and cycling in the right hand lane. The cyclist would like to change to the left lane. Check back over your left shoulder and if safe take up the primary riding position. Check back over your left shoulder again and if necessary give a clear left hand signal. If safe, return your hand back to the handlebar and move to the primary riding position in the left lane. Stay in the primary riding position until you think it is safe and then look over both shoulders and when safe return to the secondary riding position.